A picture says 1000 words | Rosi G.
I’m glad you are all enjoying my review on the Harmony Guides from yesterday’s post. I hope it proves useful to some of you when you figure out which ones to buy. When I get Volume 2 of the old set that is on backorder, I’ll post about it, too. I’ve been on an alpaca kick this year, as you all may have guessed from the numerous Capitan Hats I’ve knit. 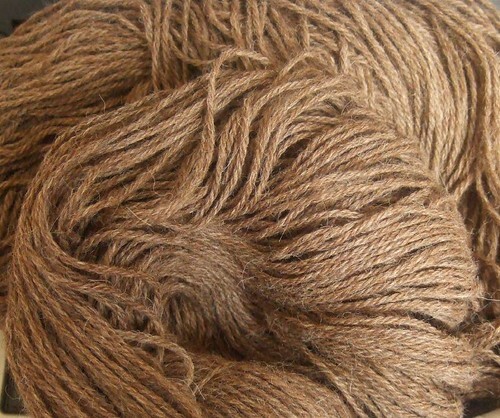 Particularly Catalina Alpaca yarns. I just finished the shrug design for them last night. Wait til you see it! It’s very flirty-girly! I have this yarn that I picked up at Rhinebeck last year. It’s not Catalina, but it is Alpaca. Henry’s Attic Prime Alpaca it’s called. I only have one picture for you but I’m sure that’s all you need in this particular case. It’s a gorgeous latte color. I’m trying to decide what to make with this yarn. Should I cast on for a sport-weight shawl with a good part of it? Should I triple it and make the Nob Hill pattern from the new Knitty? Should I double it and make a cardigan? Throw your suggestions at me! Gauge: 24 sts = 4 in. Make a sport weight shawl. How much is the yardage? I’m sure you can find a gorgeous pattern in Folk Shawls. That yarn would be wonderful overdyed, if you weren’t feeling the color yanno. Ok I wiped the sleep out of my eyes. 1995y. Sweet. Shawl gets my vote. Go for the shawl. I think three strands will make a heavy Nob Hill. I don’t think you need an alpaca sweater, but then again, I forget how cold it can get in the winter up there. I say shawl. But a circular one. You definitely have enough for a garment, but it would also make a pretty shawl. I know, I’m not helping, but both choices would be fabulous.